VLM 500 Velocity & Length Measurement - HiTECH Technologies, Inc. The VLM500 works optically and contact-free. 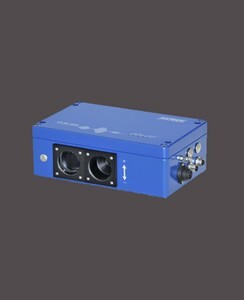 Based on a CCD sensor it implements the spatial filter principle. Spatial filter is the generic term for a measuring principle for the optical determination of velocity and length of moving objects. The spatial filter is based on the filtering effect of lattice-like structures (grid modulation). Basically, the functional principle of the VLM500 can be described as follows: The measuring object is projected on the CCD sensor which functions as an optical grid (no image taking). The VLM500 is equipped with an LED light source for the illumination of the measuring object. Due to the grid modulation a signal frequency, which is proportional to the speed, occurs upon movement of the object. The device calculates the velocity from the measured signal frequency. Several control circuits allow for automatic adjustment to most diverse materials. The VLM500 does not put high requirements on the surface character of the measuring object: Precise measurement is facilitated on periodic structures as well as on stochastic surfaces of metals, wood, rubber or paper.